From the 2017 South Dakota Grassland Coalition and Partners Project: The Nature Conservancy, Pheasants Forever, American Bird Conservancy, World Wildlife Fund, Audubon Dakota, Ducks Unlimited, Partners for Fish and Wildlife, SD Game, Fish and Parks, SD Department of Agriculture, SD Soil Health Coalition, SDSU Extension, SD Conservation Districts, USDA Natural Resources Conservation Service, and SD Grassland Coalition. We have THREE great workshops coming up that you won’t want to miss! Come on out and beat the winter doldrums! Join Sioux Falls Mayor Mike Huether at the Mayor’s Round-Up and Sale of Champions as we auction off the best market livestock from the 2018 Sioux Empire Farm Show. City slickers are invited to attend a fun dinner and program. Call 605-373-2010, email vwillson@siouxfalls.com or CLICK HERE TO REGISTER ONLINE TODAY! Prior to the Sale of Champions, we’ll recognize the Farm Family of the Year and the Agri-Business Citizen of the Year; and award the $12,000 Supreme Row purse to buyers and consignors of the purebred cattle shown at the Sioux Empire Farm Show. The purse is sponsored by the Tri-State Neighbor, Wells Fargo, and Campbell’s Supply. Return to your agricultural roots or learn more about one of South Dakota’s largest industries. Either way, you can enjoy the camaraderie of hundreds of folks from Sioux Falls area businesses. Get together with your friends and co-workers for a great prime rib dinner and to support agriculture. When you purchase livestock at the Mayor’s Round-Up and Sale of Champions, your company will be recognized in advertisements in the Argus Leader, Tri-State Neighbor and Chamber News. Business representatives who bid on the Grand and Reserve Champions market livestock for each animal species will have their photos included in the ads. The growing Sioux Empire Farm Show draws exhibitors from more than 20 states and brings more than 30,000 people to Sioux Falls annually. An estimated $3 million is brought into the greater community through the five-day show. Agriculture is South Dakota’s No. 1 industry, generating an annual revenue of $25.6 billion. By participating, you show your support for the regional agricultural community. The Sale of Champions is a big incentive for producers to attend the Sioux Empire Farm Show. In 2017, more than $75,000 was paid out to 25 livestock producers in cash awards and auction bids. By showing financial support yourself or through your business, you are able to support agriculture and promote the region’s largest market and purebred livestock show. A live and silent auction will take place to support a college scholarship for an ag exhibitor who has shown at the Sioux Empire Farm Show. The latest edition of Soil Health is out! First of all, HAPPY NEW YEAR to all of you! We’re looking forward to working on many projects with you in the days to come! 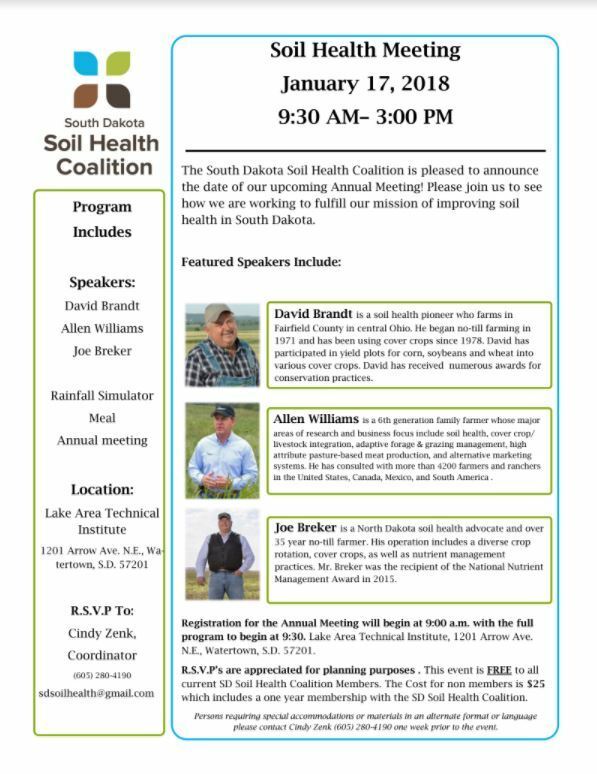 Second of all, we wanted to remind you about the upcoming annual meeting of the South Dakota Soil Health Coalition. It will be held on Wednesday, January 17, at the Lake Area Technical Institute in Watertown, SD from 9:30am to 3:00pm. There are excellent speakers and demonstrations planned, as well as a meal, before the annual meeting begins. If you’re a member of the Soil Health Coalition, the whole day is FREE for you to attend. If you’re not a member, the cost will be $25, which also gives you membership to the Coalition for one year. Click on the picture below to see more information and print the flyer. Please RSVP to Cindy as soon as you can. Hope to see you there!